There are plenty of things to consider when you need to move to a new home. You should plan and organize the whole process carefully to save yourself any stressful moments. If you have decided that you are intending to do the packing yourself you will probably need tips how to handle the packing of some specific items such as your electronic equipment. In case you are moving electronics you'd better take into consideration the fact that they are sensitive pieces of equipment, which require careful packing so that the high risk of damage during the relocation process be reduces to minimum. especially if you are not the technician type of guy you should prepare yourself really well to handle the disconnection and packing of such equipment. Items like TVs, Computers, DVDs, Stereos, Satellite dishes, Wi-Fi routers, printers require special care and extra attention. Do not underestimate this as you may finally end up spending lots of extra money on professional technical assistance needed to disconnect and connect again your systems. The most important tip to follow is to make a plan for the relocation of your electronics. This way you will not go looking for things and wondering where they had gone once you have settled. Here you can find some really helpful tips how to securely organize and pack your sensitive equipment. You should begin by reading the users guides for any specific instructions for moving. In case you cannot find any of them you may check the manufacturers' websites. This way you will take into account the specificity of each device. Then you start with the disconnection of the equipment. Before proceed to disconnecting anything though, it would be smart of you to mark each cable and port you are going to remove it from with color-coded labels so you can easily connect them again later. Remove all CDs or DVDs or USBs and pack them separately. If you are stricter you can write a detailed instructions how you have dissembled each device so that you can go back to this instructions later during the reassembly process. The best storage boxes you can use are the original pickings of your electronic equipment. Hence it is always better to keep these boxes and not thrown them after the purchase. They will provide the best fit. In the original boxes there's a place to stow any connecters and cables, belonging to the relevant piece, which can prevent possible confusion when the moment of unpacking come. If you do not have them you need to find boxes, which are just a bit larger than the above-mentioned piece of equipment. This way you will avoid possible damages during the transportation. In each box place all the parts and cables of the device duly labeled. Then seal the box and secure it with tape. If there is any empty space in the box fill it with bubble wrap or paper. Do not forget to mark the container as fragile and to indicate in which area of the house it has to be unloaded. To prevent damages it is also important to mark which end is up. The transportation of these sensitive items should be monitored closely. Put them in a specially prepared place in the van. Note that such equipment can't tolerate high temperatures. Therefore the best way to protect them is to carry your sensitive equipment with you instead of transporting it with the moving van. If you follow these packing and moving tips you may prevent your sensitive electronic devices from unwanted damages when moving them to your new home. 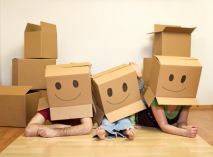 But if you worry that you cannot handle this part of the relocation process you'd better save yourself the stress and ask a trustworthy and professional moving company to do it all for you.